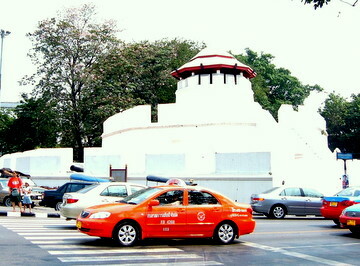 Ratchadamnoen Avenue, an old road in Bangkok, has several attractions that are steeped in history. Here’s a city guide for your tour of this famous road on your next Bangkok holiday. The avenue, linking the Grand Palace to the Royal Palaces in Dusit Garden, was built in 1899 during the reign of King Rama V. It was during the Fifth Reign that the royal residence moved from the Grand Palace to the Vimanmek Palace in Dusit Garden. Royal motorcades between the royal palace and the old city were thus a frequent occurrence along this road. This practice has continued to this day. Outer (nok) Ratchadamnoen nearer to the Dusit Garden. Please see map of this famous road. The old Bangkok attractions like the Grand Palace and Temple of the Emerald Buddha are on the stretch of Inner Ratchadamnoen. These attractions are covered in Rattanakosin. Our focus in this Bangkok city guide is on Central Ratchadamnoen Avenue. Special features in the area include an old fort dating back to the late 18th century, a famous monument, memorials, two royal temples, a royal museum and a royal art gallery. It’s pleasant to take a walking tour of this part of old Bangkok with a thoroughfare decorated with ornamental street lamps and lined with cafes, restaurants, government buildings, broad sidewalks and park benches. The area has also seen three major political upheavals from 1973 – 1992. 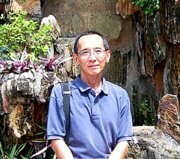 A modest hotel located at the eastern edge of Sanam Luang is the start point of our walking tour. Royal Hotel served as a first aid station and refuge to some of the demonstrators during the Black May demonstrations in 1992. Continue your stroll eastwards. Across the road is Santiporn Park near the government lottery office where there are plans to erect the Black May 1992 Memorial, in memory of those who died during those fateful days. About 300 m further down the road on the right just after the junction with Tanao Road is a memorial dedicated to those who lost their lives in October 1973, the 14 October 1973 Memorial. As you proceed further onto the junction of Central Ratchadamnoen Avenue and Dinso Road, marvel at the grandeur of Corrado Feroci’s towering creation at the traffic roundabout. 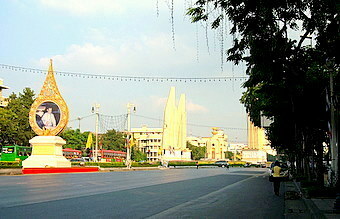 The Democracy Monument was designed by this famous Italian sculptor in 1939 to commemorate a watershed in Thai history. 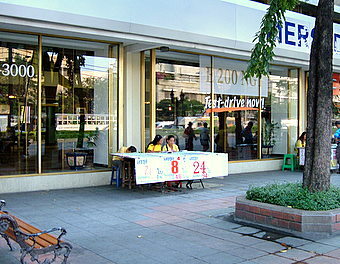 The sidewalk is lined with lottery ticket vendors selling tickets in various lucky combinations including 24, capitalizing on the symbolism of the date, 24 June 1932 when Thailand changed to a constitutional government. Stop at any of the sidewalk cafes for a drink or take a rest on one of the many park benches under the shade. 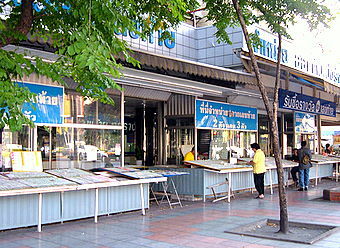 Central Ratchadamnoen Avenue ends at the Fort Mahakarn junction. 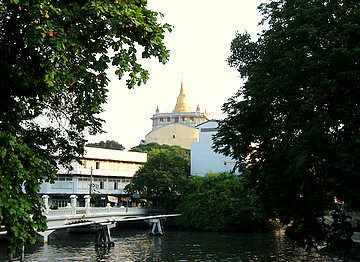 This area has five Bangkok attractions. 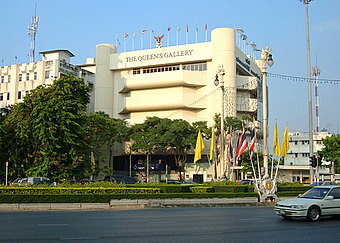 The Queen’s Gallery is across the road at the junction of Central Ratchadamnoen Avenue and Phra Sumen Road. This organization under the sponsorship of HM Queen Sirikit promotes Thai arts and crafts. The gallery holds regular exhibitions and opening hours are 1000 – 1900 hours every day except Wednesday. One of the old canals dug when Bangkok was first established as the capital is here. Fort Mahakarn one of the two remaining old Bangkok forts built in 1782, stands over this canal. Glance to your right and you’ll see the magnificent Loha Prasat or Metal Castle which holds the relics of Buddha. There’re only three such structures in the world, the other two are in India and Sri Lanka. 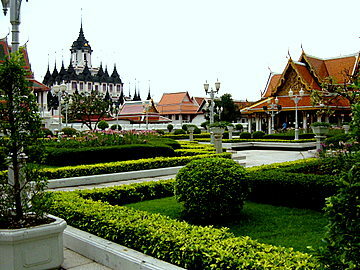 The Metal Castle is in the grounds of Wat Ratchanatdaram a temple built in 1846 in the reign of King Rama III. 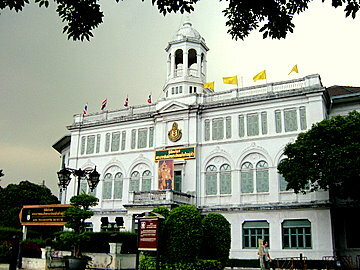 On the other side of the canal stands an old European designed building dedicated to the last absolute monarch of Thailand, the King Rama VII Museum. Wat Saket the temple on the golden mount overlooks the entire junction. The construction of this temple, which is on an artificial mount, stretched over three reigns of the Chakri kings, King Rama III – King Rama V.
There’re hardly any places of interest to the visitor in Outer Ratchadamnoen Avenue as it consists mostly of government ministries and Army HQ. Thai boxing fans might be interested in the Ratchadamnoen Boxing Stadium. 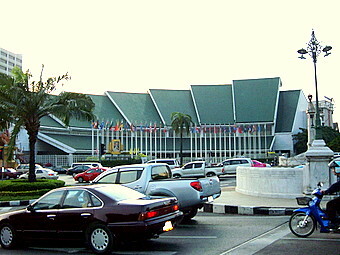 Beyond this we see the United Nations Economic and Social Commission for Asia Pacific (ESCAP) building. 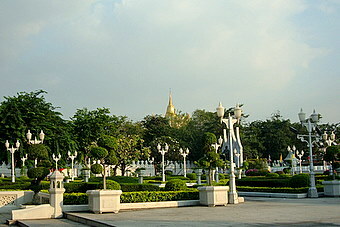 Outer Ratcahdamnoen continues on to the Royal Plaza, Ananda Samakhom Throne Hall and Dusit Garden. The following air-conditioned bus services pass Ratchadamnoen. Alternatively you can take a Chao Phraya River boat to N9 Chang Pier and walk through Na Phra Lan Road to the gates of the Grand Palace which is the start point of the avenue. If you don’t want to spend too much time on one place during your Bangkok holiday, Central Ratchadamnoen Avenue provides a good walking tour and overview of some old Bangkok attractions, a small slice of Thai history in half a day or so. To return to the Democracy Monument.